The hallmark of a successful restaurant is not whether you can fill the tables each night, but if you can get your customers to come back. 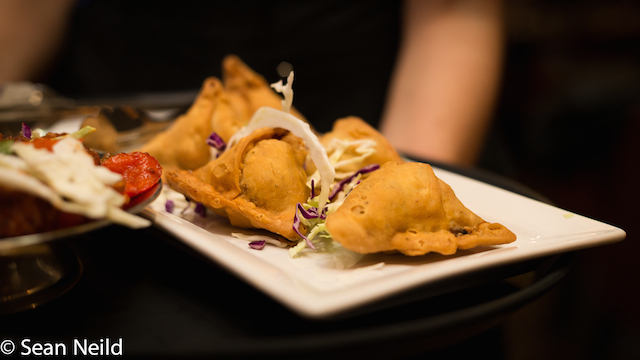 Tasty Indian Bistro has been satisfying Surrey and Delta residents for 15 years now. Eating in Vancouver was invited to attend a private dinner celebrating the restaurant’s addition of a beautiful extension and private dining area. 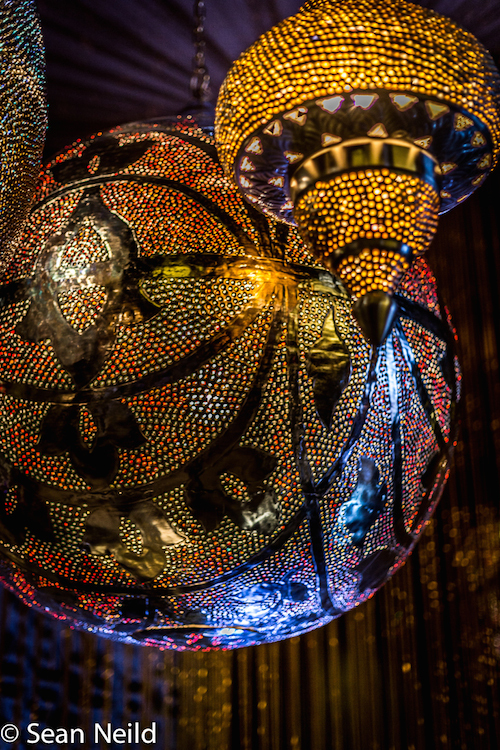 The space is modern at its core with gorgeous fixtures and accents imported directly from India. To start, we were served a selection of traditional Indian appetizers including Mango Lassis, Chicken Cocktail Samosas, Vegetable Pakoras, Chili Mushrooms, Pudina Chicken Tikka and Channa Puris. Talk about starting the evening off with a bang! All of the appetizers passed for overall quality and taste, but three of them stood out for me and should not be missed. The first one was the Chilli Mushrooms dish because of its light batter and nice mix of spices. They used whole mushrooms, so I really got a pop of flavour when biting into them. 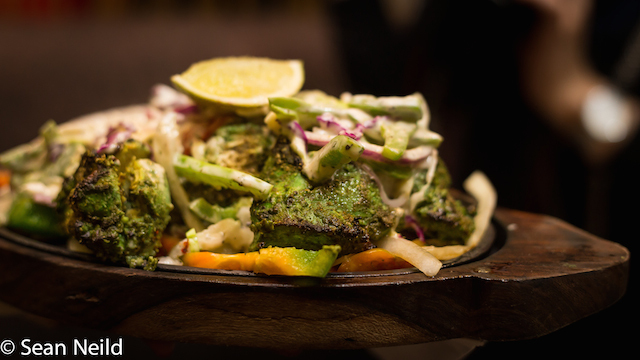 The next item was something I’ve enjoyed at other Indian restaurants – the Pudina Chicken Tikka served on a sizzling cast iron plate with sliced peppers and onions. What made the chicken so mouth-watering was the combination of cilantro and mint in the marinade. And the fact they used boneless chicken from the tandoor, giving the meat a nice char. 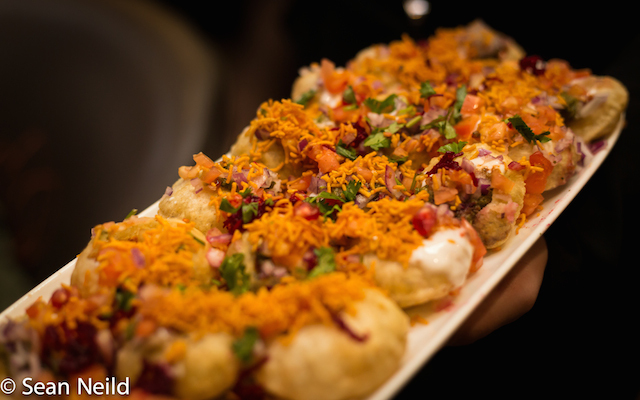 Lastly, the Channa Puris were light and airy hollow pastry puffs that were filled with a spiced whole chickpea salad. I popped the whole thing in my mouth and was met with a literal flavour burst with each bite from the chickpeas. Eight of nine of these with a glass of beer and I would be a happy camper! We all enjoyed a variety of curries including Halibut Curry, Butter Chicken, Kadahi Lamb Curry, Aloo Gobi, and a Mushroom Curry as well as Indian Style Salad, Rice and Garlic Naan. 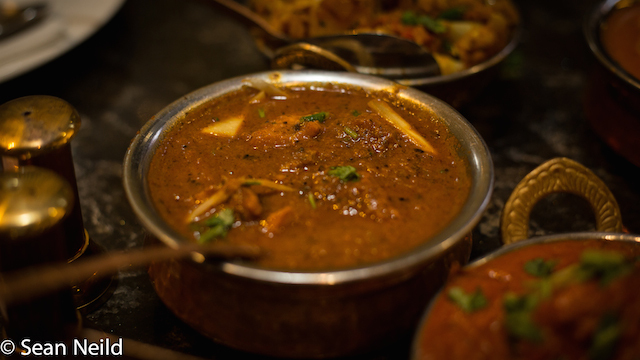 All of the curries dishes were well seasoned with just the right amount of spice to compliment the flavours, yet not set our mouths on fire. 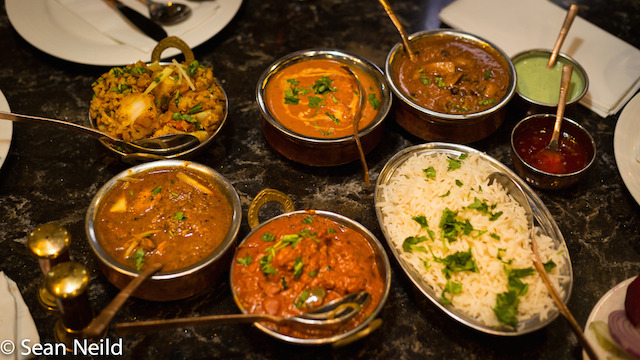 The stand outs for me were the Kadahi Lamb Curry, Halibut Curry and the Butter Chicken. I’ve eaten a ton of butter chicken in my life and I’ve come to like the tomato based tangy style which Tasty did perfectly. The sauce wasn’t overly rich and the chicken was still nice and tender. The other must-order item was the Kadahi Lamb Curry. The sauce had a huge depth of flavor, spice and it complimented the flavor of the lamb beautifully. This was something I kept going back to. Tasty also did a great job with the vegetarian main courses. All were equally satisfying with the Aloo Gobi getting my vote. 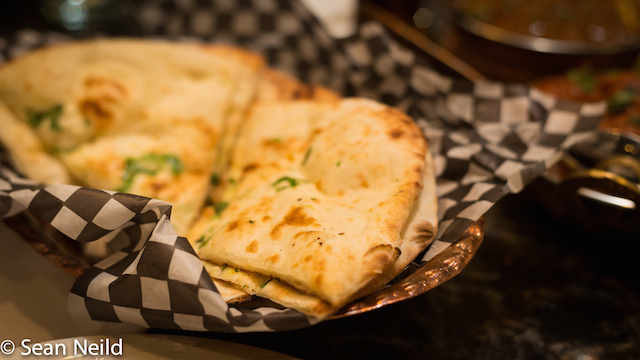 The side dishes were all pretty standard with the Garlic Naan being my favourite. It was like a pillow inside and did a great job sopping up those delicious sauces. 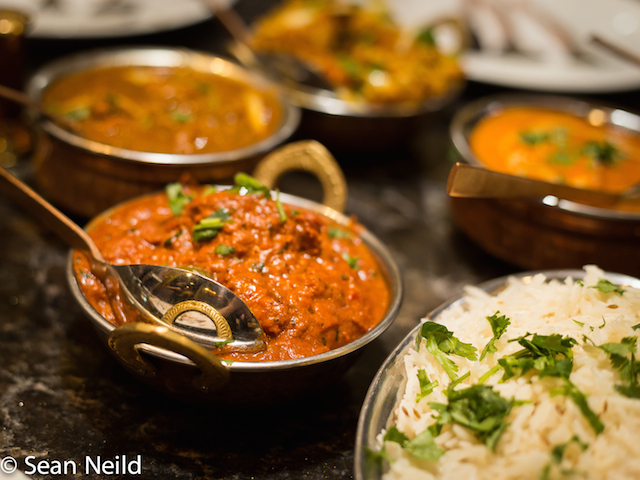 The evening at Tasty Indian Bistro had everything you could want – delicious food cooked by passionate people and enjoyed by a table full of friends. Everyone I sat with had a smile on their face and we all left with full bellies. I would definitely go back if I find myself in the area and would recommend the restaurant to anyone of looking for solid Indian flavours.